Performer Janette Hoe. Photo by Neil Newitt. Our reflex, most often, is to understand demolition in terms of damage and destruction. However, contextualised differently, we can regard the act of demolishing as an act of clearing, of re-configuring. A demolition is also a revolution — an abrupt and palpable change, a re-drawing of both space and history. Here in Australia, the living experience of extreme change is carried in the memory and cultural echoes of both the migrant and indigenous communities. Indeed, after European settlement, Australia is, in many ways, an ongoing tale of disruption, one in which invasion, disease, agriculture, mass immigration and heavy industry transformed a continent. But how do we read this change? It is perhaps appropriate that a collective of dance and theatre makers based in one of the country’s first truly multicultural regions should choose to explore what co-director Rebecca Russell calls ”the dramatic, violent change” which has affected Australia since 1788. Or, more particularly, since the 1850s gold rush in Victoria that transformed rural townships like Bendigo, Ballarat and Ararat into wealthy mining hubs with huge populations of Anglo-Irish, European and, significantly, Cantonese fortune seekers. 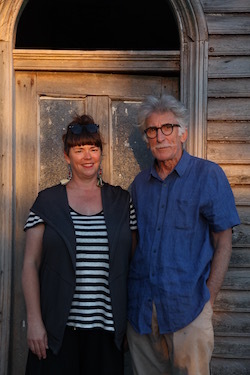 Rebecca Russell and Ken Evans. Photo by Neil Newitt. However, Demolish isn’t content to remain in the silo of “white response to black history”. Aside from the notion of big change, the work also focuses on the universal experience of home. For one of the show’s stars, dance artist Janette Hoe, the metaphors at play here are far from abstract. 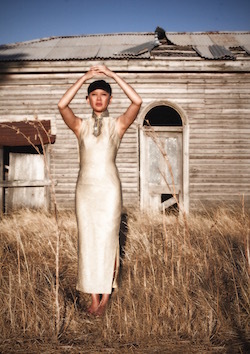 As a recent arrival from Malaysia, she bridges the old and the new, spanning two homelands and two distinct cultures. In turn, this points at something else inherent in the process of demolition — namely, the sense of impending threat and violation. Whilst we typically regard such terminology as belonging to the rhetorical terrain of history wars and rights campaigns, Russell and Evans may well discover that Demolish is tapping into something viral and contemporary. In the end, perhaps it is not just the country that is upside down. Maybe all this creative destruction has also upended the collective memory/myth we call history. Or rather, the story we call us, the anchor we call home. Rebecca Russell and Ken Evans’ Demolish will run at Bendigo Showgrounds from 11 – 15 December. 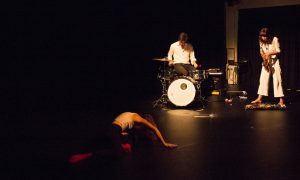 For tickets, head to www.bendigoregion.com.au/arts-culture-theatres/whats-on.